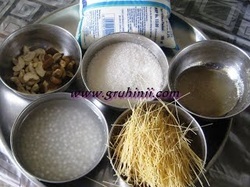 Soak sabudana for 20 to 30 mins in enough water. Boil it by adding 2 cups of water in medium flame for 10 to 15 mins stirring at regular intervals. When the sabudana is properly cooked keep it aside. Heat milk in a vessel. When it starts boiling simmer the flame and add the boiled sabudana to it. Now take a pan and desi ghee to it. 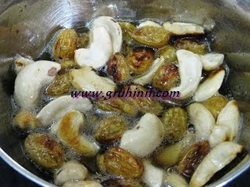 Fry cashews and raisins until golden color, remove and keep them aside. Now in the same pan fry the seviyan until golden color in a medium flame. 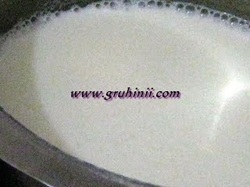 Add the seviyan to the milk and boil it for few more mins. Now add sugar and cardamom powder. Stir in between. When the kheer starts thickening, switch off the flame and take it into a serving bowl.